Maybe it's just because I know more now that I did before, or maybe it's because I know less, but I think for most people, this upcoming election is going to be a confusing mess for most people and they will need some kind of framework to help them sort it out so that they can vote the way they really want in a way that will help them and will also help their society as a whole. For example, I eat lunch almost every day with a friend at work who considers herself a died-in-the-wool Democrat. She is from Massachusetts, met and had lunch with Ted Kennedy when she was younger, and hates George Bush with every fiber of her being. If you were ask her who she is voting for for president in this upcoming election, she would say, "whomever the Democratic candidate is," because she feels that no matter what, she would never be able to vote for a Republican. However, if you ask her what the two single most important ISSUES are, she would say the Iraq War, as in getting out it, and illegal immigration, as in getting the illegals who are now here deported, and making sure that no others can come in. Why does she want us out of Iraq? Well, the most important thing is that she has two daughters of draftable age, and her feeling is that those girls are being sent to Iraq over her dead body. The draft hasn't been reinstated, of course, but the fear is that if the war continues much longer, we will have to have a draft. Secondly, she views the Iraq War as Bush's war, so if it has anything to do with him and his ideas, then she doesn't want any part of it. Why she wants illegal immigrants out of here is pretty easy to explain by the simple fact that she lives in Southern California. Actually, it doesn't even have to be Southern California any longer; I was so shocked to see the small city of Novato in Marin County (north of San Francisco) infested with hordes of illegal aliens at every street corner. You even had to shoo them away when you tried to get gasoline; there were some hovering around, sitting on the concrete curbs that surrounded the various gas pumps. They really were everywhere and, of course, this isn't even talking about you having to wait in the emergency room to get some medical attention, or have your kids try to find a desk in a public school. So which Democratic candidate should she support based on these two select issues? See the problem? For a long time, I've been aware as a voter how the one axis of decision,"left" versus "right", or how it normally turned out, Democrat versus Republican, was an inadequate scale by which to judge candidates. But now I have learned of a system that uses two axes, The Political Compass, that helps bring it all more into focus. The Political Compass still has as a horizontal axis, the familiar Left to Right opposition, which is the ECONOMIC LINE, with Socialism on the left and Laissez Faire Capitalism on the right. The more you agree with having a governmental system of taking care of people via diminished private property rights and enforced taxation and applying those funds to government-created welfare programs given out to the benefit of various select groups of people, then the more to the left you are. On the other hand, the more you believe in the right to private property and in having a free market where prices and the availability of resources are determined by supply and demand and efficient production by those who had taken on personal risk in hope of sufficient reward, without external interference, then the more to the right you are. 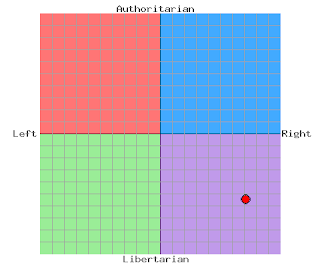 But there is a vertical axis, too, on the Political Compass, and that is the Authoritarian versus Personal Freedom SOCIAL LINE. Do people have the right to order their own affairs, or do they need the strong hand of an authority outside of themselves (such as a government) to keep them in line? I suppose at the most free point of the line the situation would be "the freedom to choose to do anything you want, even if it hurts YOU, so long as it doesn't hurt or interfere in the freedom of another." So if for example you want to take drugs (so long as you don't steal to obtain them, or drive a car or fly an airplane while on them), who else would have the right to say that you shouldn't be able to do so? Nobody would have that right, but you, yourself, to determine your own actions. But if you feel that people could not, or should not control their own affairs, but require experts, or those who have a greater might, or feel that they have a superior moral standing, to make those determinations for them, then you stand on the Authority end of the axis. Governments, of course, and the people who desire to hold office in them (and thus obtain greater personal power) tend to be on the side of AUTHORITY (so long as it is THEY who are the authority!). Some of the problems we have today is that people can no longer imagine having no authority over them; they willingly subject themselves to such rule (and thus, slavery), because an opposing idea is inconceivable to them. Or if they think that they could handle that kind of freedom, they sure don't think their fellow man could, so they want there to be an authority to keep their neighbor in line, and if they, themselves, have to submit to that same authority, well, it's a small sacrifice to pay in order to keep the peace and to feel safe. Notice I said "feel" safe and not "be" safe. But I believe that to truly be safe, or at least safer, in the world, requires a self-reliant and mutually-cooperative populace of equals (equal opportunity, not equal outcome), not a horde of subjects who have given everything over to an external power to rule, protect, and save them (which it will ultimately fail to do). Benjamin Franklin, one of the main founding minds of our country, said that those who give up their freedom in order to gain a little safety will end up losing both. Isn't that happening to us, today? While it is not surprising to me how much on the SOCIAL freedom side I placed, I know that a year ago, I wouldn't have placed so far on the right, because I was like so many others; for so long we have swallowed the socialistic propaganda we have been fed, so that no longer can people think of "big oil companies" without thinking "greedy big oil companies". Despite their utter dependence on oil, people nevertheless want to hamper big oil companies by, for example, taxing their "windfall profits". But exploring, finding, drilling for, refining, bringing to market, and selling petroleum and its products is a hugely costly and risky business. It requires incredibly large investments and a long lead time before those investments begin to pay off. Well, these big oil companies have laid their money on the line and they are bringing in the product; do they not deserve to reap the benefit of their efforts? Of course they do, and some of that benefit will be used to keep the machinery going for some more. Throw a monkey wrench into that and you won't even be walking to work, you won't have a job, because your former employer couldn't function without petroleum, but maybe you will be able to plow with a mule a field you sharecrop. Let's use a different arena...J.K. Rowling who struggled so long and lived so meagerly, wrote the first Harry Potter book by hand, at a cafe. This was her own creation, brought forth by the sweat of her brow and her steadfast discipline to bring this creation "to the market". Where and how does J.K. Rowling stand, today? She is the second richest woman in England. Does she not deserve the full benefit of the risks and struggle she made, and the reward for her marvelous and well-loved creation that has brought joy to so many people and nearly single-handedly made children into readers again? Will the profits she will make on her most recent novel in the series be considered "windfall profits," deserving of increased taxation? I think not, and you shouldn't think it either, or else whatever raise you next get for some achievement at work that earned you a promotion, or the extra salary you earn due to that master's degree that you earned for yourself taking night classes while you worked full time should all be taxed away, too. What I find it interesting are those people down in the southwest quadrant, the Gandi and Dalai Lama quadrant. Gee, shouldn't we be down there? Well, Gandi ran around in a loincloth; I guess he didn't care about property rights so much. And the Dalai Lama has no home; he and his people are living in India kind of like the Katrina victims who needed help getting out of New Orleans were welcomed by Houston. Maybe that's unfair, the Tibetans were "victims" (of the Chinese), but the socialist side of the economic line is FOR victims. But somebody has to pay the bills. As far as I can see it, just about the only way you can have that southwest quadrant, which is sharing of property and assets without being forced to by authority, is to have some kind of commune or spiritual community with shared values. There haven't been too many of those that have been successful, but I can see how it could work out if everybody agreed. After all, one of the tenets of the FREEDOM axis is that people have the freedom to order their affairs any way they want, just so long as other people's freedoms aren't harmed, so if everybody agrees to live in a mutually beneficial socialistic system, then that is their right. I don't view Gandhi or the Dalai Lama as being, or having been, corrupt. This isn't rule by Stalin. Would it work in a country as large as the United States? Maybe, but it's hard to imagine. We might think we have a Gandhi, but end up with a Castro. 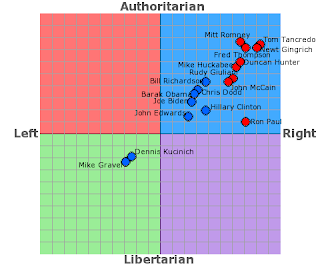 Wow, virtually all of them (except Kucinich and Gravel) are somewhere in the AUTHORITARIAN/CAPITALISTIC quadrant, EVEN Ron Paul, the freedom candidate, and even Hillary Clinton, whom I and others have blithely branded as a socialistic candidate. Fortunately, not a Hitler or a Stalin among them, which helps me to breathe a little bit easier. And notice that few of them are all that different from the much-disapproved-of President Bush. Maybe this is just a sign of how the powers that be simply WANT us to have that kind of a candidate ONLY, so that is all we get. For me, coming out like Milton Freedman on the FREEDOM/CAPITALISM quadrant (the pure Libertarian quadrant), the closest candidate for me is Ron Paul, who the media continually crows has nothing but crackpots for supporters. Well, he does graphically show that he stands out from the bulk of them (again except for Kucinich and Gravel), but hardly "crackpot". He, by the way, is who my friend at work should vote for, even though he is a REPUBLICAN. He says he will pull us out of Iraq IMMEDIATELY, and he also wants to clear out the illegal aliens (he's from Texas, so that makes him like us in California). For me, the Iraq War isn't the big issue, because I have decided that I have absolutely NO idea what is going on down there, so I have little qualification for making a decision. Unlike many people, I don't get all my news from one or two sources (who have a definite agenda of manipulating the public). I get news from a huge diversity of sources, conservative and liberal, religious and athiest, domestic and foreign, and I have heard so many conflicting stories, from it's a total mess to we are actually accomplishing what President Bush set out to do, that I simply have to guess at the truth. And what I guess is (a) we got Saddam Hussein out of there, (b) there were no weapons of mass destruction after all, (c) our government has been so far successful in preventing any other serious terrorist attack, so they more or less can truly say "Mission Accomplished" based on the basic mission they presented regarding going in there. But to stay further, will further results be worth it? I believe what Ron Paul says when he says that (a) the war was illegally declared Constitution-wise, (b) we are invaders in foreign soil which agitates terrorists against us (just as we would be, say, if we had been invaded by China...or let's say Japan, ha ha ha), (c) we can't afford it, our dollar is nearly collapsed as it is and we are now in debt up to our eyeballs, (d) the founders of our country warned against foreign entanglements, and (e) we can protect ourselves with our soldiers back at home and with a renewed, refreshed, and more efficient intelligence system. So all that sounds good to me. To me the absolute most important issues are to prevent the steady enroachment of our civil liberties (so I want to pull toward the FREEDOM pole of the vertical axis, which is "south") AND to prevent the destruction of our FREE ECONOMY (so I want to pull toward the FREE CAPITALIST side of the ECONOMIC pole, which is "east"), so who on that chart is the most "southeastern" candidate running, but Ron Paul. And so that is what makes sense to me. If Ron Paul does not get the nomination, who is next in line for me? I have to place a ruler on that chart at a diagonal from northeast to southwest, starting at the southeastern corner, and slowly move up to see who that line touches after Ron Paul. Surprising to me, who that ends up being is Hillary Clinton. She's closer to Ron Paul than I ever would have thought (but not THAT close!--she's just closer than the others). Hillary, good Lord, who woulda thunk it? (But she's corrupt, I think, which Ron Paul isn't; for Ron Paul to lose the nomination, which the media is doing its damnedest to make happen, would be a terrible loss.) After Hillary, it's kind of a crap shoot. The worst though, would be that awful Biden-Obama-Dodd-Richardson-Romney line. And horribly, both Obama and Romney are being pushed as really strong candidates. On the INTERNET, just like Ron Paul is strong, so is Obama, so THAT'S a bad sign. Romney's the most AUTHORITARIAN of the bunch, so that is really bad. Edwards is the most SOCIALISTIC of the bunch (again excluding Kucinich and Gravel), which is also bad. Anyway, if nothing else, it's all fascinating, and I still have to comfort myself by saying that despite where they stand, we can thankful we have no Hitlers or Stalins in there. If you're somebody who never even considered Ron Paul (probably because of the media's hatchet job), here is a WEALTH of information. And once you see what the media is really doing, it will make you hopping mad. And then if you want to REALLY get into it, please check out this INCREDIBLE ARCHIVE of Ron Paul writings. You will see that this brilliant and scholarly man has been around for quite a long time, and has been very prolific. He's certainly not new on the scene like that fraud Huckabee. I've known of Ron Paul for decades. It seems that whenever something bad happened in Congress (which was a lot), Ron Paul was always that lone individual who did what was RIGHT. And by following the Constitution and trying to continue what the founders of this country carefully set up, you could hardly do wrong. You wouldn't expose yourself as such an obvious crackpot if you tried editing your posts for a change. Thank you for your comment, FGFM. An insult from you (TWO insults) is very high praise indeed!